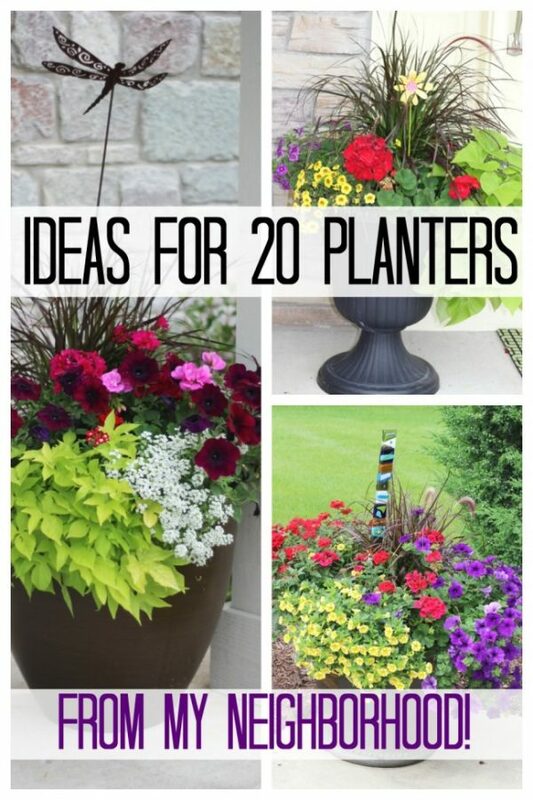 Ideas from 20 planters from my neighborhood! Here is my collection of over 20 planters (container gardens) created by my neighbors. If you need some flower planter ideas or inspiration for your plant pots this year, you’ve come to the right place! Most of these planters are for the front door or on a porch. Look at these 20 large outdoor planters! 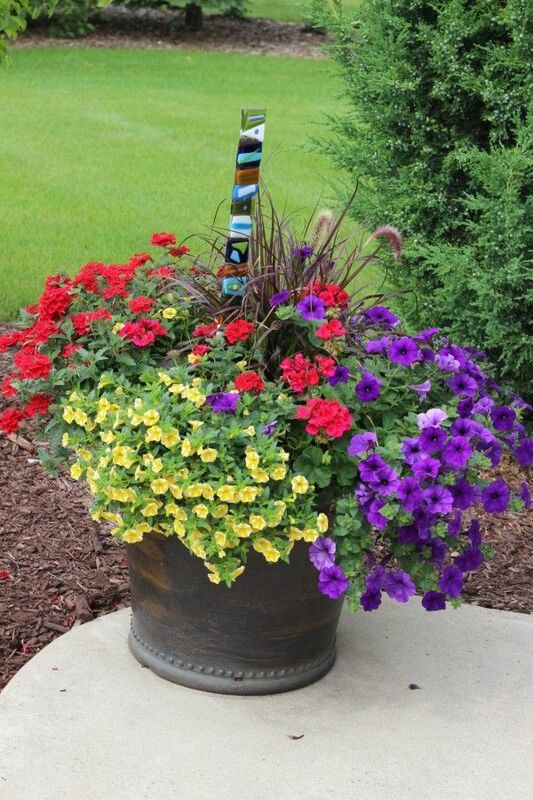 Great ideas and inspiration for your DIY flower container gardens. Over 20 real container garden ideas from my neighborhood. Perfect for your front door or porch! I hope these inspire your own flower planters for this summer. I know I’m busy looking for ideas right now. I thought I would share these with you and maybe you will find an idea or two that works for you and your home. I originally wrote this post in the fall, but now is the time you really need to take a look. There are affiliate links in this post. Read my disclosure policy to learn more. Here is my planter, all grown up! 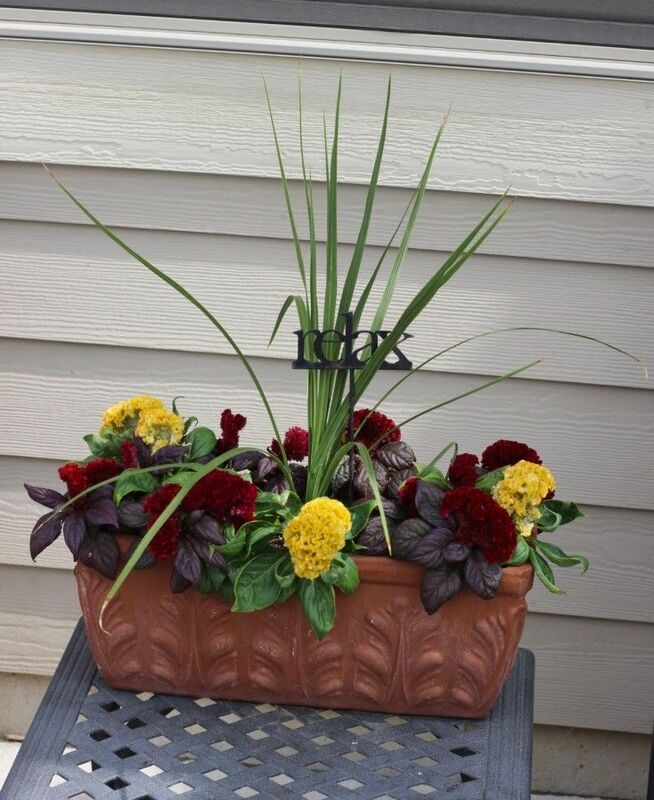 I say that because this is the planter I showed you when I did the How I Planted my Planter tutorial. If you want to see how this one started, and what I planted in this container garden, please click through the link. I just love having flowering planters at my front door! Enjoy these beautiful planters! I did talk to the owners of these planters and they shared their main tips. I will share those tips at the bottom of the post. Another one of my container gardens. 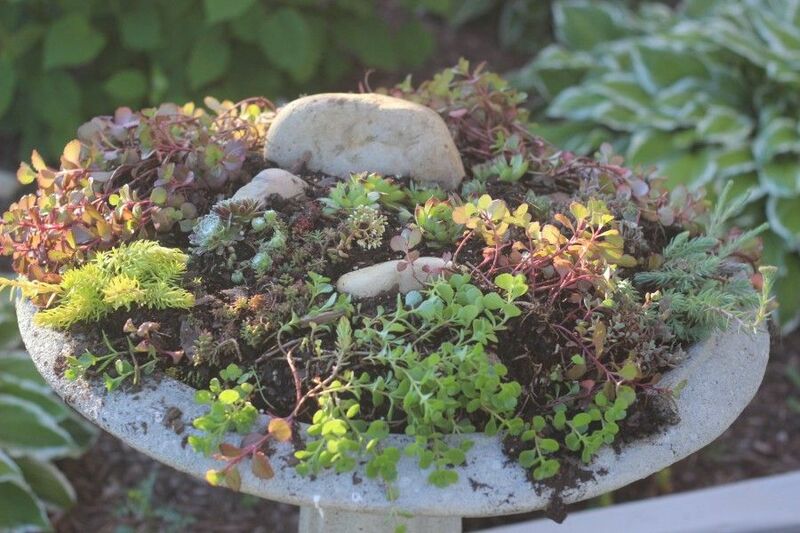 It’s actually a succulent garden in a birdbath. 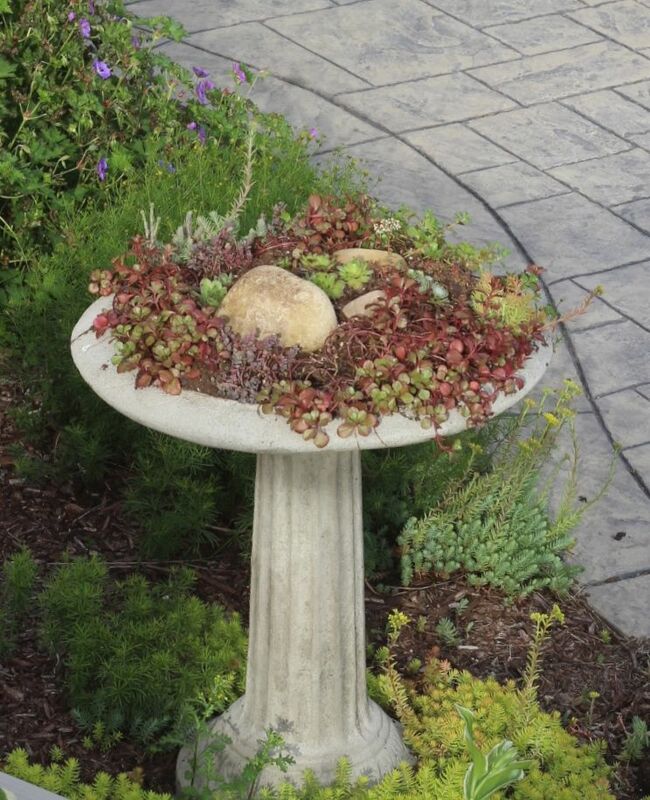 Take a look at my DIY for my Succulent Bird Bath. I do love cement bird baths! 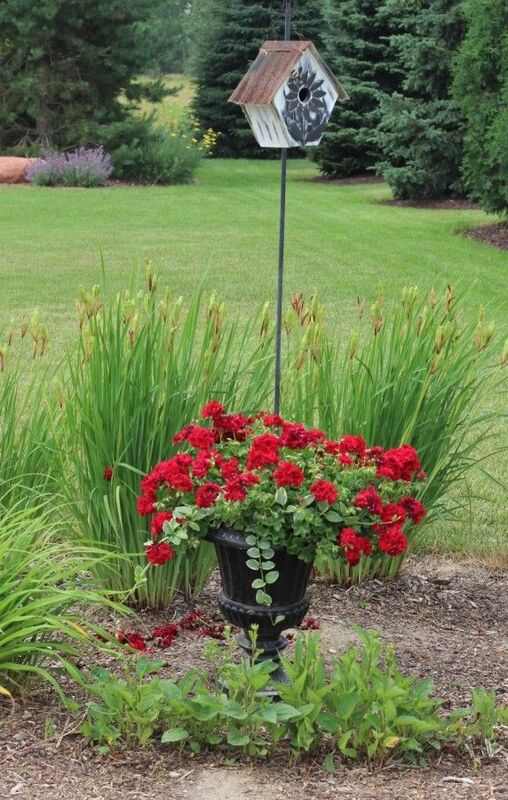 And, I love adding height by putting in a pretty container garden stake in my flower pots. Here is a pretty close-up of this succulent garden in the morning sun. If I could hand out awards, I would give the Best Planter Patio award to my neighbor Diane. Diane just does such a good job of choosing interesting plant pots and interesting flowering plants. 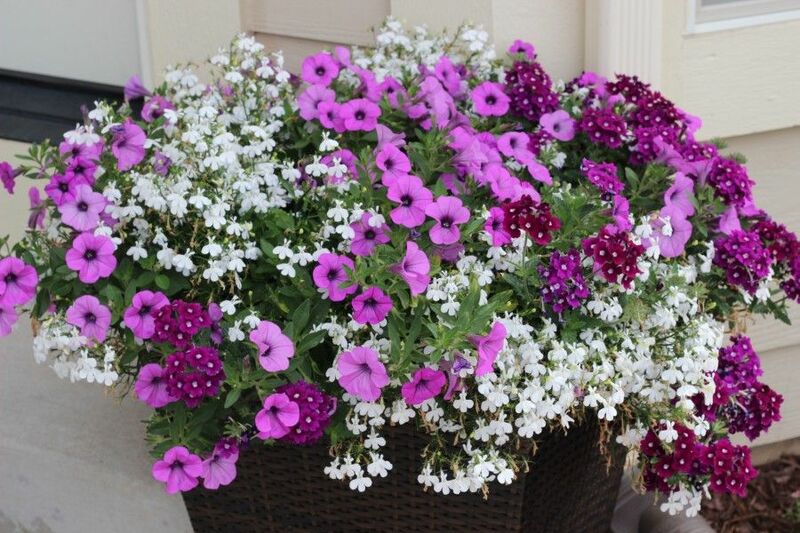 Plus, there are many combinations of traditional patio plants that always do well. 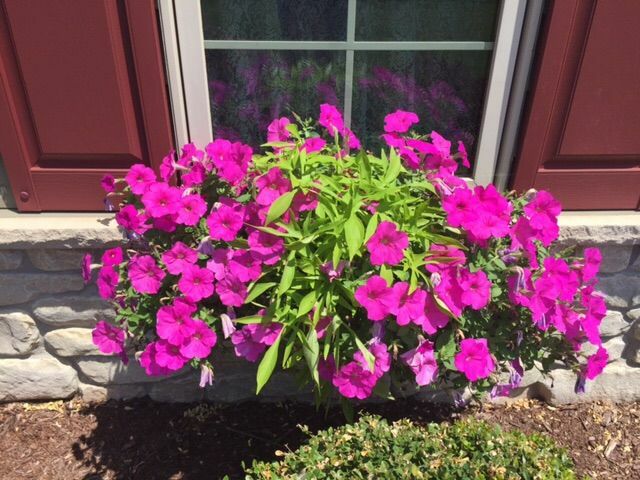 You need to look closer to see how pretty the petunias and sweet potato vine looks. Technically not a planter, but I love how this clematis was planted in the little spot where the patio post is set. I need to add flowering perennials to my outdoor patio/deck areas. It’s a much wiser financial investment than annuals. Have a birdhouse and need a place to put it? I love putting something into my pots to give additional height in my planters. My frustration has been the poles tend to lean. I’ve found this (affiliate link) pole stabilizer and may order a few to solve that problem. You just need to make sure you put it in before planting so that no plants will be harmed during its installation. 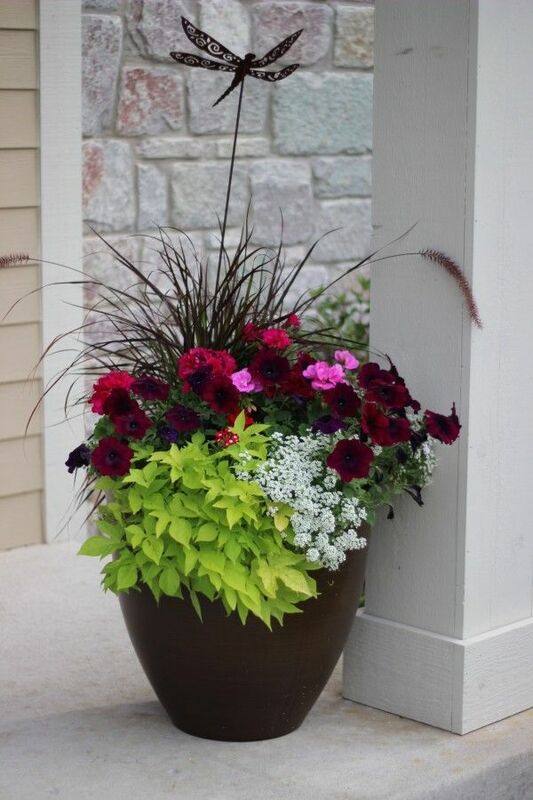 Here is another area where perennial plantings are used to showcase a planter. The grasses really make the colors of the flowering plants and the plant pot pop. Don’t you like the birdhouse on a stake? I’m thinking about getting this. 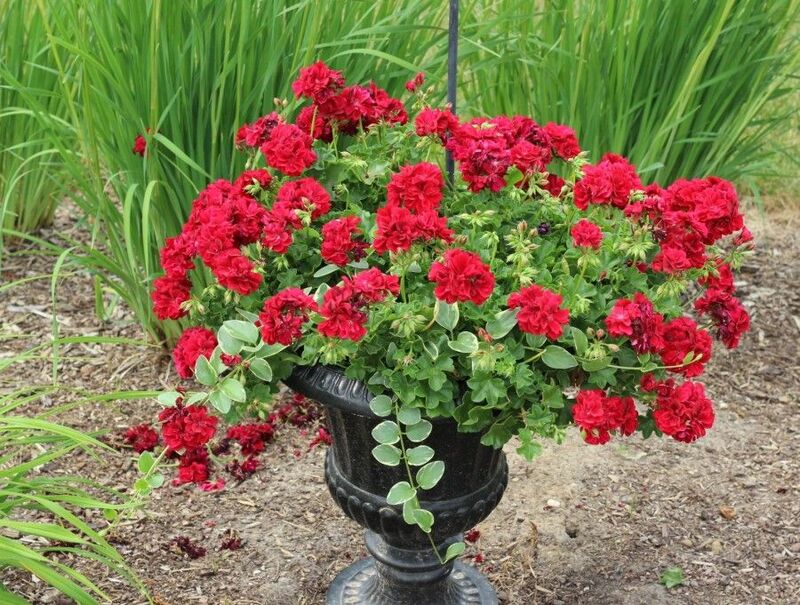 I LOVE using red geraniums in my container gardens. Obviously many of my neighbors do too! Pretend the hibiscus below is blooming. Cause my timing was never good when I went over to check! I do love the hibiscus and ivy combination. Don’t you like how the birdhouse was added to give height and the flowers edge the taller plant? 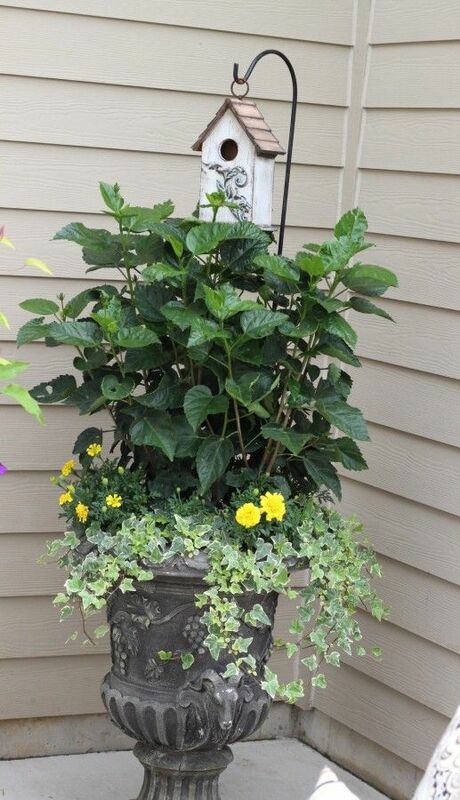 It really makes this planter with a taller plant look put together. I’m eying purchasing this birdhouse because it’s so stinking cute! And, the front door. Diane’s geraniums always look great! Of course, I have to show you my friend Amy’s planters! We often discuss our plants, our yards, our homes, and our kids…. Amy is just so talented! And lucky for us, she’s willing to let us see what she does with that talent! I know she makes all of her own planters because I’ve often shopped for the flowering plants and other appropriate patio plants with her. 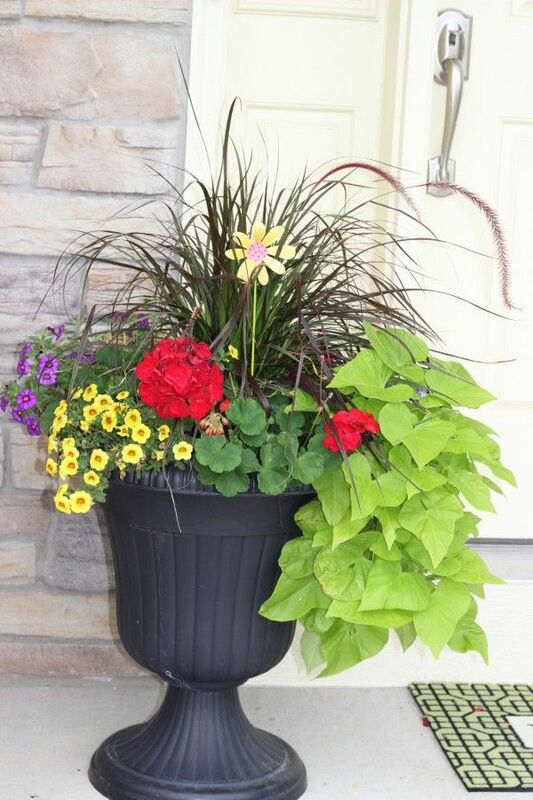 Below is her super cute front door planter. If you haven’t noticed, Amy’s planters all have a little piece of ‘decor’ in them. Pretty glass poles, metal flowers, and other cute items just finish off the look of the planter. A little container garden tip, these extra decor items are especially pretty when the planter is newly planted and the plants haven’t filled in yet. Other flower planters to inspire planter ideas. 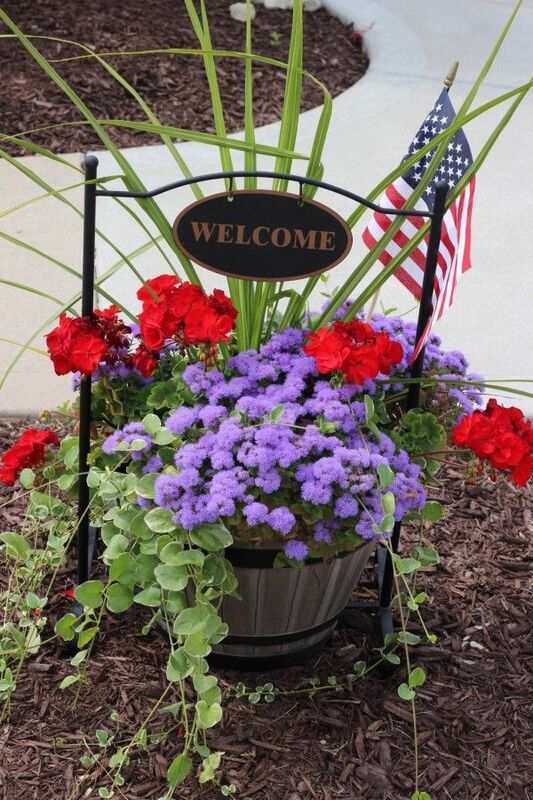 One of my favorite “Welcome” planters. I know it was purchased like this but the planter just really works in it’s location. Plus it’s pretty. And, right in the scorching sun. So, I’m impressed it keeps looking this good! 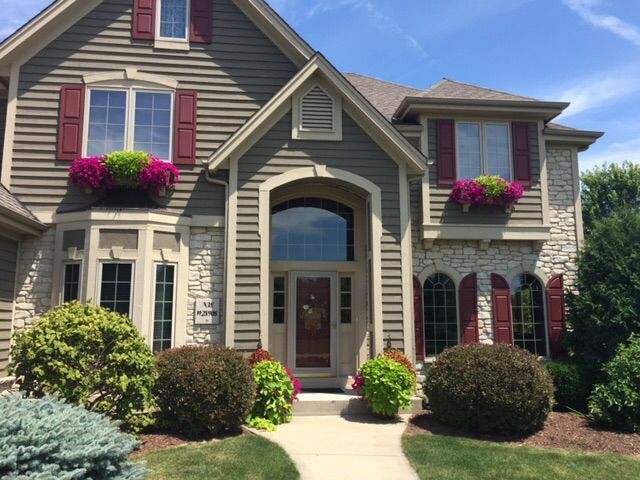 Window Boxes – another outdoor planter option. Here is the window box I showed being planted in a previous post. Isn’t it pretty and full now? 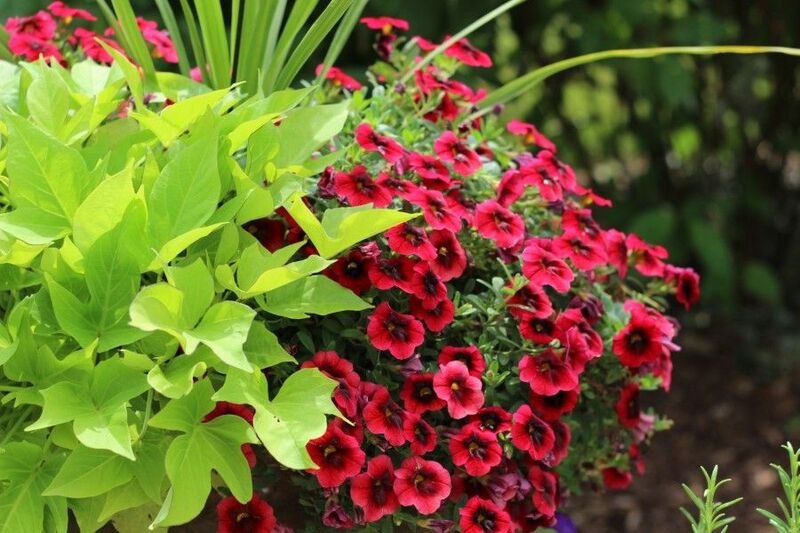 Ingrid shared her secrets for successful window boxes in this Window Box Planter Tips post. Look at the pretty color it adds to the house! How smart to have the builder add window boxes when the house was being built! A few more to show you! I just love looking through my flower pictures in the winter. It helps cheer me up then. 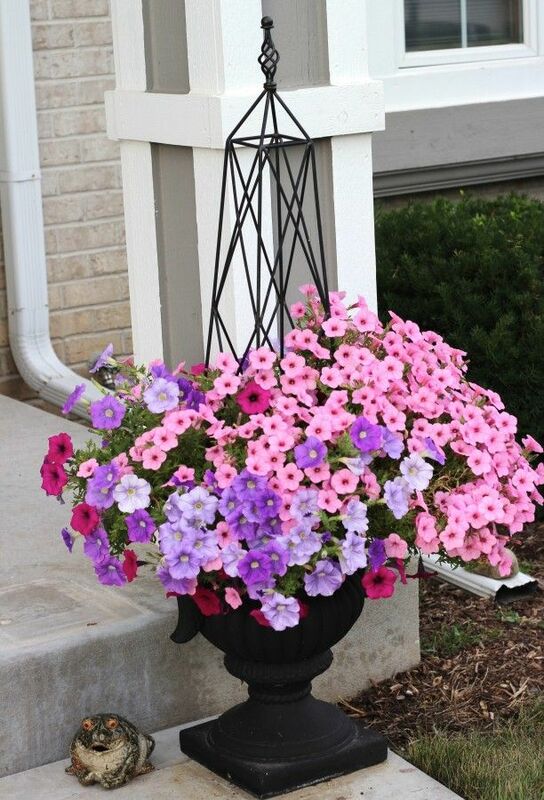 This is a simple petunia arrangement but the trellis adds some height and visual interest. I’m planning on doing something similar but am thinking about having a climbing plant in the middle. This type of (affiliate link) trellis is not expensive, especially for how much visual interst they give! This is so pretty because of its simplicity. Plus, I like the little ceramic frog :)! Looking for some tips and hints on how to put together beautiful flower planters? As I was taking pictures, I was chatting with these green-thumbed people. Are you surprised I was chatting? Well, you shouldn’t be : ). One more pretty planter to look at and then I have provided you with the list of advice given to me by my friends. I summarized the advice for you. 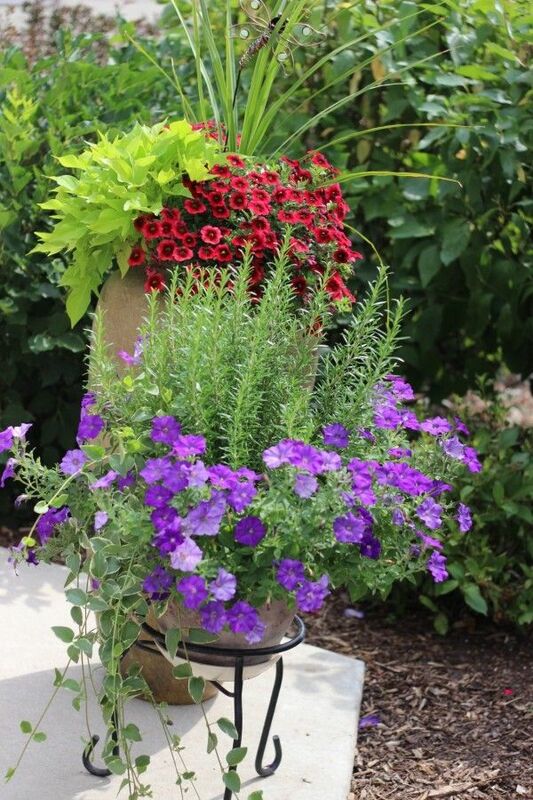 If you follow it, you will have an amazing flower planter too! 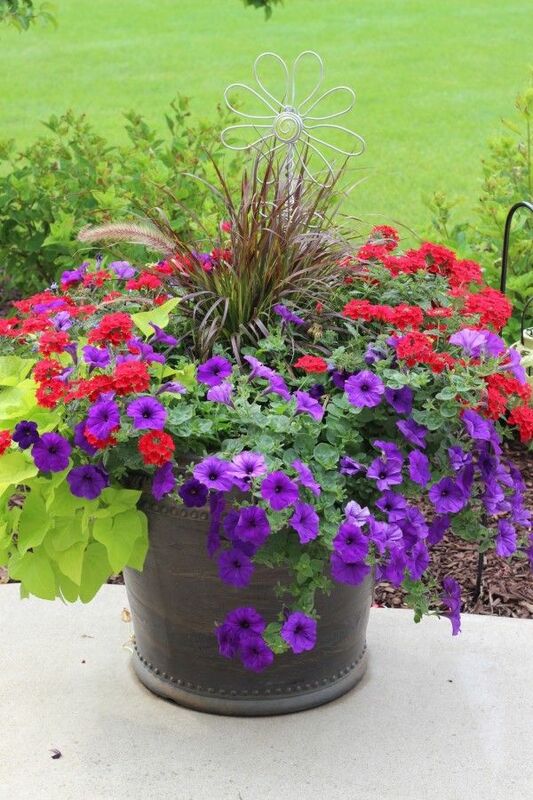 Flowering Planters – tips and tricks. 1. Everyone seems to be a fan of Miracle Grow. They use it more frequently than what the directions state. It’s commonly mixed at the strength recommended on the bag, but fed every one to two weeks. Our summer season in Wisconsin is so short and the planters can only hold so much. 3. Trim those plants. The last couple of petunia pictures were taken on Sept. 7th. They were still going strong when most other’s were scraggly and droopy. They were cut back about two weeks prior. And, I was also told to make sure to regularly trim the sweet potato vines. They look so much better when plants aren’t dragging on the ground. 4. Beware the sun and heat spells. Sometimes, the planters need to be pulled into shadier areas to give them a little break. 5. <strong>Deadhead your flowers!!</strong>. A must for geraniums. 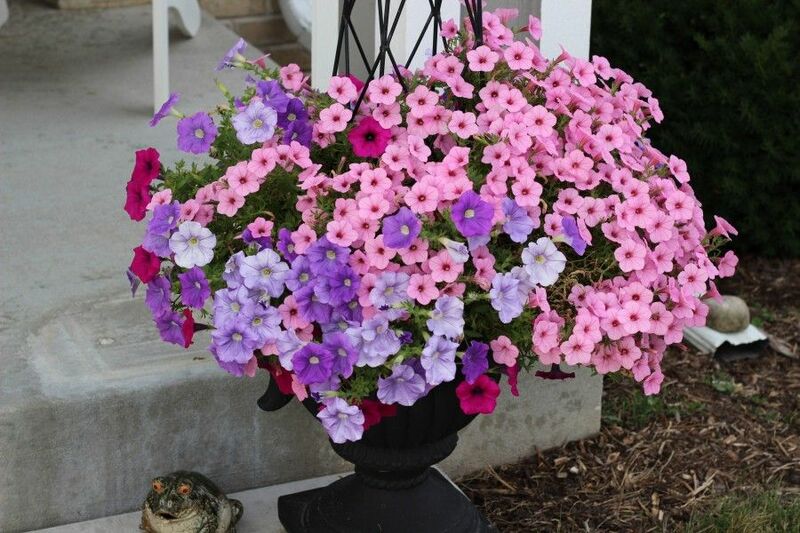 Even petunias benefit from deadheading. It doesn’t take long if you do it regularly. All deadheading means is clip the finished bloom off the plant. I always keep pruning shears handy so that I can just clip the old flowers off when I have jus a minute or two. 6. Lastly, but here is one of the most important tips. Buy great plants from a good source. A weak looking plant never seems to do really well. Make sure you buy healthy looking plants from a reliable source. Not sure where a good spot is to buy? Ask your neighbors, who have plants you admire, where they buy their plants. Hopefully, they will tell you! 7. People that have beautiful planters aren’t “lucky”. They do something for them almost every day. Hope this post has given you lots of inspiration. Looking for some more ideas? 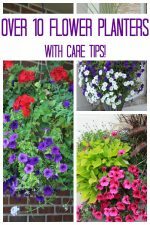 These are some of my most popular container gardening posts! 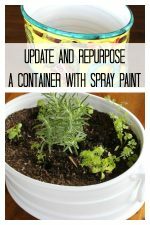 Make your own unique and inexpensive LARGE planter. How I planted my outdoor planter | flower container. Pretty Planters – 20 more planters! Window Box Planters – some ‘how to’ tips. 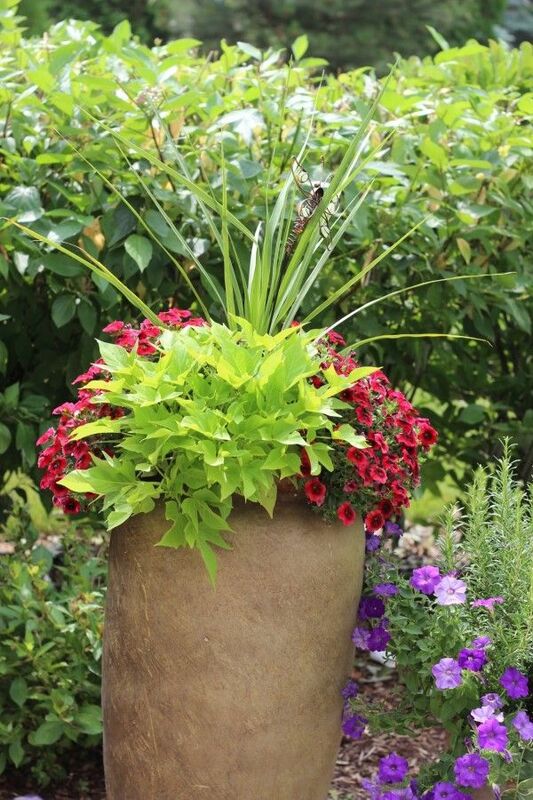 Plan your fall planter in the spring – reuse your grasses! 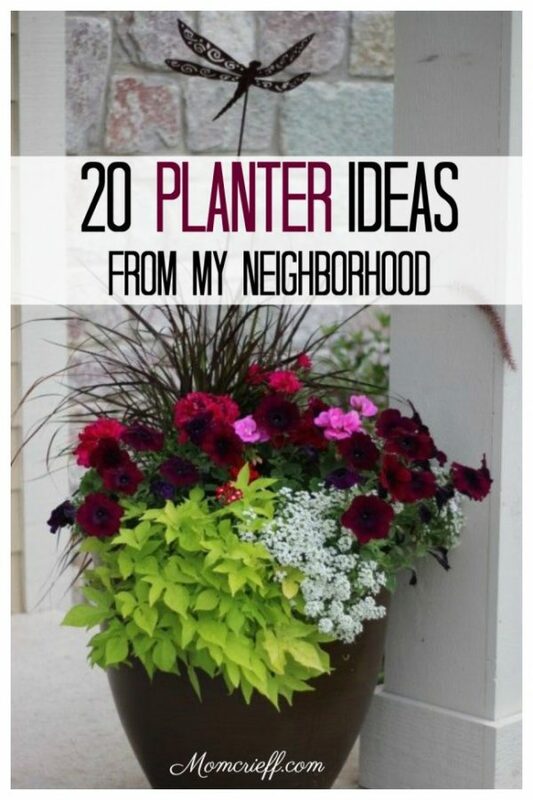 Over 20 planter ideas from my neighborhood. « Sweet Potato Pancakes. A different spin on potato. Great tips! I have one for you that works wonderers! In fact I did this after my fil helped me move my Chaste tree. He helped me dig up the football and managed to cut it to maybe a 5-10 gallon size, I/2 of what it was. Then drove it down the highway at 55! When it got to our new house it looked dead. I immediately got it in the ground, but the next day every leaf was brown, by the third day they fell off. Within two weeks of replanting it had new green leafs and it even bloomed that year. I devised my own method of using a diaper in the planter trick. I bought the biggest size dollar general had, two small packs and filled every single diaper up with as much water as it would hold. Then after placing about 4-6 cubic yards of soil I’d tear the diapers open and cover the soil, then lightly rake it in. Then I balled up up newspaper and made another layer. Then more soil, then more diapers then more newspaper and finished with soil. I finished it up with torn cardboard as a weed barrier, tearing the strips to fit and mulched. After mulching I used miracle grow quick start. And then watered once a day. For about 10 days. LIGHTLY. The diapers don’t go away. Once the water has been depleted from the goop it fills up with whatever water fertilizer mix you use. Slowly nourishing your plants. It saves big bucks all year! The chaste tree has grown so much more than it did at our previous house where I didn’t do this. I wouldn’t put the diaper goop in a regular hole in the ground either. I made a raised bed for the chaste tree so it stays contained with the soil. It is perfect for this and planters too. I live in south Louisiana where temps in August reach the hundreds and more years than not we are wearing shorts at Christmas. It has worked beautifully every time I’ve done it and works tremendously better than just using the whole diaper. As for the cardboard trick it was what I had on hand and mostly clay soil with only about 2-3” of good soil. ( my parents God bless them aren’t gardeners ) Since we bought the house after losing ours in the Louisiana August 2016 flood I haven’t had to pull but a few weeds and that’s been this year. The cardboard is breaking down and amending my soil as well as keeping all those pesky weeds away, not to mention keeping the roots and plants warm on those cold days! In 2017 we got snow twice in two weeks, unheard of here and it stuck. All of my plants thrived, none of which were covered. The newspaper has also been helping in both departments! Hope this can help y’all out too! Those planters are gorgeous! Could you please advise what you and yourneighbors do for pest control, such as aphids and mealy bugs? 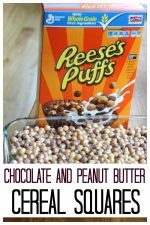 Just click through the Pinterest image and that will take you to the blog post with the planters. Hope you see some ideas you enjoy! I would love to see some of the planters. Thank you. Loved your pictures and am inspired. May i suggest you add how much sun these arrangement need. I need heat tolerant plants that are low maintenance as i travel but want flowers. It depends! You should talk to your local nursery and find out when the average last frost date is in your area. Plant about a week or two after that. No guarantees there won’t be another frost, but usually, it’s safe to plant. I am in the northeast, when do I starrt? I bought it at a spring craft show. I love my dragonfly stake! The best advice I got regarding flowers/planters was: filler, spiller, thriller. 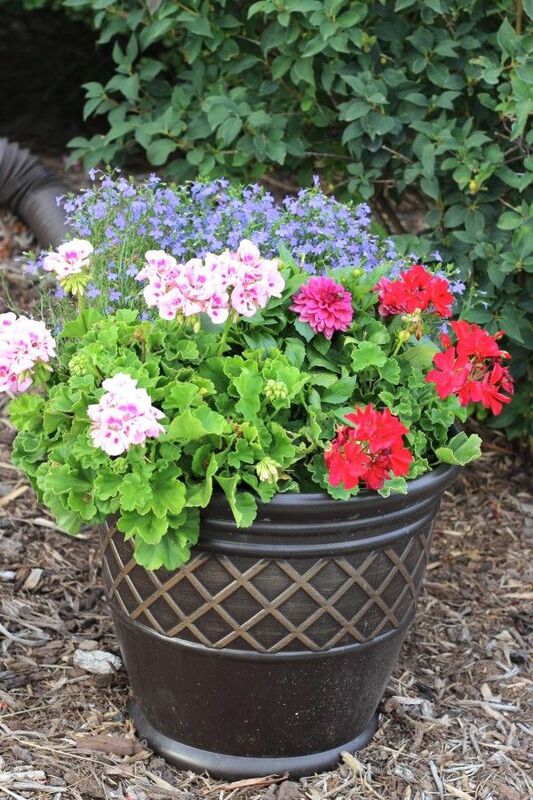 If you pick and plant your flowers according to those, you’ll have a beautiful planter. Look at the majority of planters you see, and you’ll notice that pattern. Enjoyed your pictures I am in love with pic # 1 where did you get the dragon fly stake ?! Yes, a very important thing to do to keep those flowers blooming! Deadheading is pinching back or snipping off the dead blossoms to encourage more flowers. (There are affiliate links on this site. Read my disclosure policy to learn more). Hi! Welcome to my blog! So glad you stopped by. 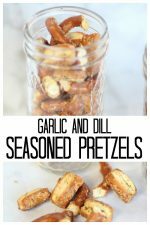 My name is Susan and I love to share easy recipes, simple DIY's and gardening tips. Everything is easy and doesn't take a ton of time. Who has time for something hard? 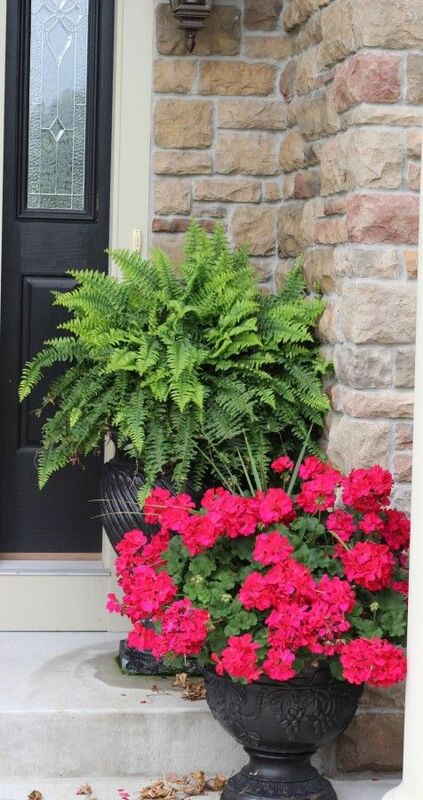 How to plant a front door flower planter / container garden. More favorite planters (flower container gardens)from my neighborhood (10+)! Momcrieff is a participant in the Amazon Services LLC Associates Program, an affiliate advertising program. This is designed to provide a means for sites to earn advertising fees by advertising and linking to Amazon.com. Hi! Welcome to Momcrieff! So glad you stopped by. 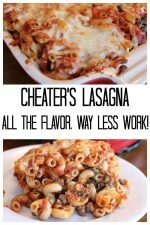 My name is Susan and I love to share easy recipes, simple DIY's and gardening tips. New, I'll be sharing updates from my 1920's house!